The EPO’s central role in the unitary patent system means that an organisation that is not subject to EU rules or laws will wield a key power: to grant or refuse EU-wide patents on inventions. The EPO will receive 50 percent of the patent renewal fees charged for unitary patents, with the rest being shared out among the other EU countries, just as EPO earnings are today. We do need to know how patent strategists, litigators, portfolio managers and investors think, and their insights can be valuable. But we also need a lot more firm information before we can obtain a clearer view as to whether this carefully-planned and extensively revised scheme for litigating Europe’s patents is better, the same as or worse than the patchwork of national courts that preceded it. “Well, it’s time to abolish or mothball and shelve the UPC rather than pretend it’s inevitable and “prepare” or learn it.”He is paid by companies that prop up the system and strive for patent maximalism, so how objective is he really? He literally helps set up events for patent trolls, in which their reputation is being collectivity laundered. “They must be thinking of predators and opportunists from across the Atlantic, not legitimate European businesses, maybe just lawyers’ firms. “No, no, no. They must be thinking of predators and opportunists from across the Atlantic, not legitimate European businesses, maybe just lawyers’ firms. What a nonsensical rhetorical question. Wild is hijacking their voice or preaching to them. This is lobbying or advocacy, it’s not news. 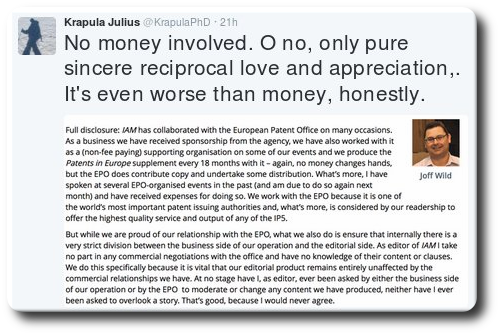 We used to be polite towards IAM and give it the benefit of the doubt, but there’s no point being too polite to the EPO and its propagandists as lack of antagonism would let them eat Europe alive, without resistance/opposition.